The UCF Knights men's basketball team represents The University of Central Florida located in Orlando, Florida, United States. UCF competes in Division I of the National Collegiate Athletic Association (NCAA), and the American Athletic Conference (The American). The Knights play their home games in the CFE Arena located on the university's main campus. They are coached by Johnny Dawkins who was hired in 2016. The Knights have appeared in the NCAA Division II Tournament six times (1976, 1977, 1978, 1980, 1981, 1982), including the Final Four in 1978. UCF has reached the NCAA Division I Tournament four times (1994, 1996, 2004 and 2005). UCF has won twelve conference championships, seven regular season championships, and five tournament championships. UCF played its first intercollegiate basketball game before the team even had a nickname. In the Division II era, under Torchy Clark, UCF found great success including a DII Final Four appearance. UCF has competed in the Atlantic Sun Conference (formerly called the Trans American Athletic Conference), from 1992 until 2005, when all sports joined Conference USA. As a Division II team, the Knights had been a charter member of the Sunshine State Conference from 1975 to 1984. The Knights also had a brief one-year stint in the Sun Belt Conference. UCF has had six head coaches since organized basketball began in 1969. The Knights have played nearly 1,200 games in their 44 seasons. In that time, three coaches have led the Knights to the postseason: Torchy Clark, Kirk Speraw, and Donnie Jones. Clark in 1976, 1977, 1978, 1980, 1981, and 1982, O'Leary in 1994, 1996, 2004, and 2005, and Jones in 2011 and 2012. Clark is the only coach to successfully lead the Knights past the first round of the NCAA Tournament, reaching the 1978 Final Four following a 24–game winning streak. Speraw is the longest tenured coach in program history at 17 seasons. Clark remains the winningest coach in school history with 274 wins in 14 seasons. Donnie Jones, who was hired in 2010 was fired by UCF on March 10, 2016. Johnny Dawkins, who was fired by Stanford, was hired on March 22, 2016. Eugene "Torchy" Clark, served as UCF's, then FTU's, first head basketball coach. In 1969, Clark, who was a Wisconsin high school coach, was responsible for starting the university's basketball program from scratch. The creation of the program had only been approved by the Florida Board of Regents five months prior to his hire. That year, as a club level team, the Knights went 11–3, including a 99–38 victory in their first game over Massey Tech. The first season would serve as an omen for UCF basketball, with Clark bringing the university unprecedented success as a Division II team. Roaming the sidelines for 14 seasons, Clark never had a losing season, and built UCF into a national power, bringing the Knights five Sunshine State Conference regular season championships, one conference tournament championship and six NCAA tournament appearances in eight years. In 1978, Clark led the Knights, which at the time were riding a 24–game winning streak, to the Final Four in Minnesota. During his tenure, the Knights were ranked in the top 10 nationally for seven consecutive years. Clark earned Sunshine State Coach of the Year honors four times and won the conference's coach of the decade award. While at UCF, Clark coached both of his sons, Bo and Mike. All three men are members of the UCF Athletic Hall of Fame, and Clark is a member of the Sunshine State Conference Hall of Fame. Bo is the Knight's all-time leading scorer with Mike second on the list, and as a freshman in 1976 Bo was the nation's leading scorer. The father-son duo were featured in a 1979 Sports Illustrated issue. On February 26, 1983, Clark coached his last game as a Knight, with UCF falling to Florida Southern. During his tenure, Clark's squads went 274–89 (.754), winning 20 or more games in a year on seven occasions. Clark enjoyed a 71–13 (.845) record in the Sunshine State Conference. In the decade after Clark retired, the Knights had only one winning season, the year after he left. Replacing the legendary Torchy Clark would prove impossible for his successors. The three men that would replace him, went a combined 96–180 (.347) in 10 seasons, including only one season with a winning record. Hired to be Clark's replacement, Chuck Machock, an assistant coach at Ohio State, took the helm for the 1983–84 season. That year, Machock led the Knights to a 15–13 record, earning the teams sixth Sunshine State Conference regular season championship in their final year in the conference. The next year, UCF ascended to the ranks of Division I, earning a 10–18 record under Machock in what would be the Knights first losing season, and Machock's final season with the team. In two seasons, Machock led the Knights to a 25–31 (.446) record. Following their first losing season, the Knights hired Phil Carter. Carter would coach the Knights for four years, earning a 34–76 (.309) record. In his first year with the team, the Knights suffered a disappointing 6–22 record. The next year, Carter engineered one of the top improvements in the nation, leading UCF to a 12–15 campaign. From there the club would falter under his lead, earning 9 and 7 win seasons respectively. Carter finished his tenure without a winning season, manufacturing a 34–76 (.309) record. Coming from Birmingham-Southern, coach Joe Dean replaced Carter. Dean led the Knights through a tumultuous four-year period, with two conference affiliation changes. In his second year with the team, UCF joined the American South Conference, the team's first affiliation since joining Division I. The next year the conference became the Sun Belt Conference, and the next year the Knights joined the Atlantic Sun Conference. In 1991, the Knights moved from their original home-court, which was in the education building, to their new court inside what's now known as "The Venue" In their last game in the education gymnasium, the team lost to Louisiana-Lafayette 85–94 on February 23, 1991. On November 30, 1991, the Knights posted an 82–74 victory over Campbell in their first game in the new arena. In his four seasons with the Knights, Dean earned a 37–73 (.336) record. Like his predecessor, Dean did not enjoy a single winning season during his tenure. Former Head Coach Kirk Speraw with fans. Following the departure of Joe Dean, on July 28, 1993, Kirk Speraw, an assistant coach at Florida, was hired as the Knights new head coach. During his 17-year tenure, Speraw led the Knights to four Atlantic Sun Conference tournament champions, one regular season championship, and all four of their NCAA tournament appearances (94, 96, 04, 05). When Speraw took the helm in 1993, UCF had only one winning season since Torchy Clark left a decade earlier. In his first year with the team, Speraw led the Knights to an 11-game turnaround (21–9), earning the team their first Division I NCAA Tournament Appearance. After a down 1994 season, Speraw once again led the Knights to an NCAA Tournament appearance in 1996, their second in his first three years. In the team's last two years in the Atlantic Sun Conference, the Knights won both the 2004 and 2005 conference tournaments, and were the 2005 regular season champions as well. Despite their success, the Knights have never progressed passed the first round of the NCAA Tournament as a Division I team. UCF made its debut in Conference USA in 2005, and the team earned a birth in the Conference USA Championship Tournament in their first year. The Knights would fall to Houston in the second round and close out the season with the program's first losing record (14–15) since 2000–2001. The Knights made a huge turnaround in the 2006–07 season, finishing 2nd in conference play to Memphis with an overall record of 22–9. Speraw won 2007 Conference USA Coach of the Year honors. The Knights would play their first game in the new UCF Arena on November 3, 2007, an 86–78 win over the Saint Leo Lions. In their first regular-season game in the new arena, the Knights would win 63–60 over the Nevada Wolf Pack, on November 11, 2007. In thrilling fashion, the Knights defeated the Tulsa Golden Hurricane in triple overtime 97–91 in front of an announced crowd of 7,097, in their first home C-USA game in the arena on January 11, 2008. In what would be his final season with the team, on February 2, 2010, the Knights defeated the East Carolina Pirates 67–56, earning Speraw his 275th win at UCF, passing Torchy Clark as the winningest coach in program history. Following a disappointing 2009–10 season in which the Knights went 15–17, the university decided not to retain Kirk Speraw bringing an end to his 17-year tenure. Speraw garnered a school-high 279 wins (on 233 losses–.544), including 118–90 (.567) in the Atlantic Sun and 40–38 (.512) in Conference USA. 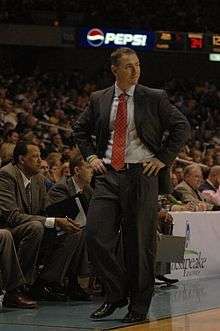 On March 30, 2010, UCF announced Donnie Jones as the university's new Men's Basketball Head Coach. On December 1, 2010, the Knights upset the #16 Florida Gators 57–54 giving the Knights their first victory over a top 20 opponent as well as their first victory over the Gators. Following a 10–0 start to the 2010–11 season, the Knights were nationally ranked for the first time in program history at the Division I level. At the time, UCF was one of nine unbeaten teams, and one of only four schools to be ranked in the BCS standings and the AP basketball poll. The Knights would continue to start the season 14–0, their best start since moving to Division I, ranking as high as #18, and would open conference play with a defeat of Jones' former team, the Marshall Thundering Herd. UCF would finish the season 21–12 (6–10), with an appearance in the College Basketball Invitational. Jones led the Knights to the biggest win in program history, when on November 25, 2011 they defeated the defending national champions and then-ranked #4 Connecticut Huskies 68–63 in the inaugural Battle 4 Atlantis tournament. Jones would lead the Knights to a 22–11 record in 2012, including the programs first ever NIT berth. Following an investigation into recruiting violations in the men's basketball program in 2011, on July 31, 2012, the NCAA announced sanctions – in addition to penalties UCF self-imposed. The NCAA imposed a one-year postseason ban on the program. The penalty is in addition to a $50,000 fine, adding two years to UCF's previously proposed three years' probation, reduction of basketball scholarships, and the vacating of basketball victories for three seasons in which there was an ineligible player. Despite the sanctions, Jones led the Knights to their third consecutive twenty-win season in 2013 with a 20–11 record. Jones was fired on March 10, 2016, leaving with a 100–88 record at UCF. Former Stanford coach Johnny Dawkins replaced Jones as head coach on March 22, 2016. The Knights have appeared in four NCAA Division I Tournaments. Their combined record is 0–4. The Knights have appeared in the NCAA Division II Tournament six times. Their record is 6–9. The Knights have appeared in one National Invitation Tournament (NIT). Their record is 0–1. The Knights have appeared in one College Basketball Invitational (CBI). Their record is 2–1. The Knight's have taken the hardwood in three venues, all of which are still standing on UCF's main campus. The Knight's first permanent home was in the College of Education's gymnasium. Seating under 1,000, this court served the team for over 20 years. The UCF Arena, now known as the The Venue, broke ground in 1990 and opened for play in 1991. The Knights played their final season in the venue in 2007, going 15–1 at home only losing to the Elite Eight bound Memphis Tigers. The final game saw UCF defeating East Carolina 77–64 in front of 3,725 people. UCF averaged a then-school record 2,706 average attendance during the season. 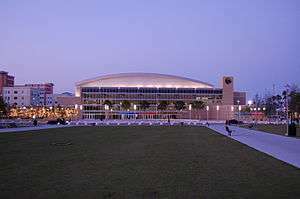 UCF moved into its new home for the 2007–2008 season, the 10,000 seat CFE Arena. The Knights opened up their new arena against the reigning Western Athletic Conference champion Nevada Wolf Pack on November 11, 2007 in front of a crowd of 4,668. The attendance record in the new Arena is 9,825, which was set on January 10, 2009 against the Memphis Tigers. When the basketball program moved into the New UCF Arena in the fall of 2007, the facility could hold more students than ever before. To go along with its new facility and its new commitment to basketball, a new student section was formed. The "Knightmare" debuted on January 11, 2008. Adorned in their black Knightmare shirts, the students completely filled the bleachered section behind the basket and the overflow section in the upper deck. In what will go down as one of the greatest basketball games in UCF basketball history, the Knights defeated Tulsa 97–91 in triple overtime in front of a then-record crowd of 7,097 fans. One of UCF's most unusual basketball traditions is its free throw chant. Started by the "Kirk's Jerks" in the 1990s, UCF fans started holding their right arms with clenched fists almost straight up when a UCF player shoots a free throw. When the basketball is made, the fans would stomp their right foot twice, clap their hands twice, make a shooting motion with their right hand while chanting "woosh." In the more recent years, after the appropriately named Stomp Stomp, Clap Clap, Woosh chant, fans will chant U-C-F afterwards, making a U, a C, and an F over their heads. During the 2010-2011 season, a group of students attempted to start a new tradition; if a UCF player makes all of his free throws, the chant is followed by "ballin'." There is also another tradition where if the opponent goes for a shot and gets an "air ball," the chants ring out the entire game for that one player. It's been shown as an effective way to get into the player's mind. 1 2 "CFE Arena". UCF Athletics Association. Retrieved 2011-01-31. ↑ UCF Graphic Standards (PDF). UCF.edu. 2011-12-20. Retrieved 2016-03-24. ↑ McMurphy, Brett. "Old Big East now American Athletic". ESPN. Retrieved 4 April 2013. ↑ "UCF hires Johnny Dawkins as basketball coach". USA TODAY. Retrieved 2016-04-07. 1 2 3 4 5 6 7 8 9 10 11 12 "2007–2008 UCF Knights Men's Basketball History". UCF Athletics Association. Retrieved 2011-01-31. ↑ "UCF Conference Affiliation History". UCF Athletics Association. Retrieved 2009-04-23. ↑ "UCF extends coach Donnie Jones through 2018". Sports Illustrated. 2013-06-21. Retrieved 2013-06-30. ↑ "UCF ousts Jones after six seasons, 100-88 mark". ESPN.com. Retrieved 2016-03-16. 1 2 "Sources: UCF hires ex-Stanford coach Dawkins". ESPN.com. Retrieved 2016-04-07. ↑ "UCF Mourns the Passing of Coach Torchy Clark". University of Central Florida. 2009-04-22. Retrieved 2009-04-23. 1 2 "He's A Tough Gun Of A Son". Sports Illustrated. 1979-12-17. Retrieved 2009-04-23. ↑ "There'll Never Be Another Torchy Clark". Rivals. 2010-01-22. Retrieved 2009-04-23. 1 2 3 4 5 6 "UCF Knights 2005–2006 Opponents and History". UCF Athletics Association. Retrieved 2011-01-31. 1 2 "The Speraw File: Taking a closer look at Kirk Speraw's tenure at UCF". Orlando Sentinel. 2010-01-22. Retrieved 2011-01-31. ↑ "Central Florida defeats Tulsa 97-91 in three overtimes". USA Today. 2008-01-12. Retrieved 2011-01-31. 1 2 "UCF Athletics Will Not Retain Men's Basketball Coach Kirk Speraw". UCF Athletics Association. 2010-03-15. Retrieved 2011-01-31. ↑ "UCF to Introduce Donnie Jones as Men's Basketball Head Coach Tuesday". UCF Athletics Association. 2010-03-29. Retrieved 2011-01-31. 1 2 "UCF Basketball Notoriety Grows with First National Ranking". ESPN. 2010-12-20. Retrieved 2011-01-31. ↑ "UCF basketball upsets No. 4 UConn, earning biggest win in school history". Orlando Sentinel. 2011-11-25. Retrieved 2011-11-25. ↑ "NCAA adds 1-year postseason bans to UCF penalties". WESH TV Orlando. Retrieved 31 July 2012. ↑ "NCAA adds 1-year postseason bans to UCF penalties". NBC News. Retrieved 2 August 2012. ↑ "2006–2007 UCF Knights Season Statistics". UCF Athletics Association. Retrieved 2011-01-31. ↑ "Jermaine Taylor traded to Sacramento Kings". ESPN. 2010-12-14. Retrieved 2011-01-31. ↑ "UCF Knights stun Gators in basketball". Florida Today. 2010-12-02. Retrieved 2011-01-31.